Recently I did a post about NuroFocus. I reviewed the product and generally had good things to say about it. After another week and more research, I just wanted to update you on a few things that I’ve learned and experienced. First of all, my review is still positive. As I said, the effects are subtle but they are there. A full two weeks is required in order to experience the full effect. That and taking the correct dosage. One thing I’ve noted is how much better I sleep at night and how rested I feel in the morning. I wasn’t expecting that, but apparently it is one of the benefits of taking NuroFocus. By the way, getting a better quality sleep each night can do wonders for your ADHD symptoms all by itself. We ADDers aren’t known for being able to fall asleep easily or wake up easily and we are often restless when we do sleep. A better night’s sleep is definitely a good thing for us. 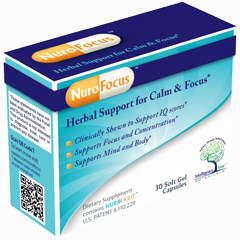 The other thing that I found out about NuroFocus has to do with the way the ingredients are extracted. NuAxon’s process is the Gold Standard when it comes to extracting the beneficial elements of plants and herbs while preserving their integrity. It’s a little complicated but I will try and explain it as best as I can. The following is courtesy of Jason Edwards at NuAxon. extract of the water soluble and the fat or oil soluble compounds. Traditional extraction pulls out only the compounds that are compatible with that solvent. Water gives you only water soluble ones; oils give you oil soluble ones. gentle on the plants and the environment. If I understand this correctly, NuAxon uses a method that not only pulls out the compounds needed but does so in the gentlest way possible for both plant and environment. The result is a super pure, super potent compound. This sounds like something that is good for our bodies and good for the environment too. « What’s Wrong with Putting Yourself First? Hi, Brenda, I am the woman who contacted you a few months ago about writing an article as a guest blogger. I just wanted to let you know that I finished writing it. Please contact me so I can submit it. Taking NuroFocus now and experiencing lots of gas as a side effect. Is there a way around this? Only been about 5 days, is this also good for anxiety? Can’t find too much on this particular herbal. Hi Ginger – NuroFocus contains both flax seed and bacopa, both of which can cause gas. Try eating yogurt with probiotics or drinking kombachu; either will help with digestion. If you are into essential oils, try some therapeutic grade peppermint oil. And yes, it does help with anxiety.